Equipped with a dependable and efficient 19 HP Briggs & Stratton overhead value engine and automatic hydrostatic transmission that doesn't require stopping to change speed or direction, the all-new Poulan PRO PPX19H46 46 in. 1.. Equipped with a dependable and efficient 19 HP Briggs & Stratton overhead value engine and automatic hydrostatic transmission that doesn't require stopping to change speed or direction, the all-new Poulan PRO PPX19H46 46 in. 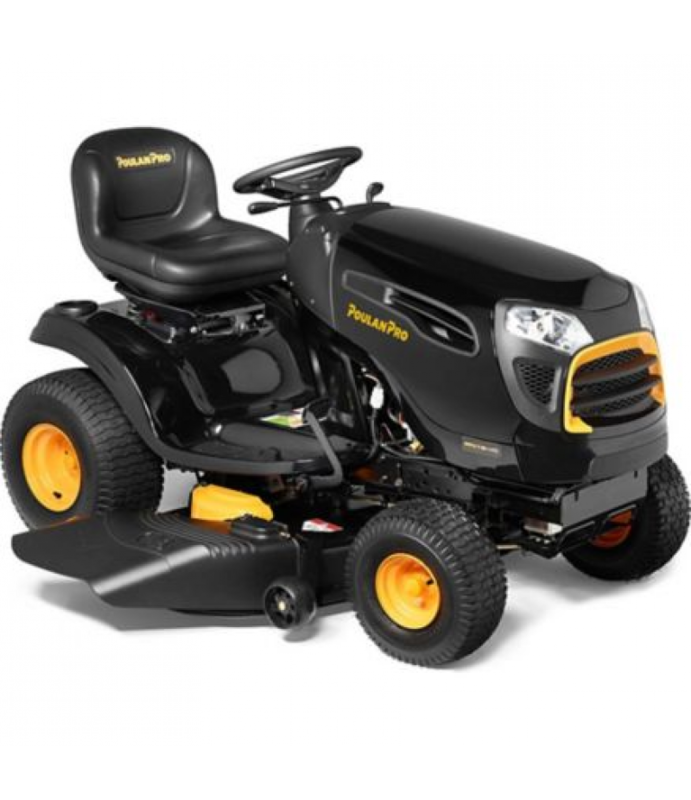 19 HP Briggs & Stratton Riding Lawn Mower packs a lot of punch. It features Poulan PRO's newest super-rugged 46 in. Steelguard cutting deck that has welded reinforced steel construction for added durability and long life (includes lifetime limited deck warranty) and provides excellent airflow to lift grass for a cleaner cut. It also features mow-in-reverse technology that keeps blades engaged for continuous mowing while shifting in and out of reverse direction. The front axle is made with welded, heavy-duty steel for superior strength and durability and, with a spring-assisted deck lift with 6 cutting height positions, it's easy to choose your favorite grass height or adjust to the best height for the current condition of your lawn. The tight 16 in. turning radius is perfect for maneuvering around challenging terrain and obstacles like trees, shrubs and flower beds, and 4 anti-scalp deck wheels reduce the risk of scalping your lawn when mowing uneven terrain. Other convenient features include a 15 in. high-back seat that adjusts quickly for a perfect fit and comfortable ride (with no tools required); built-in water hose connector for quick, simple grass and debris clean-up; headlights; and a cup holder to keep your favorite beverage right at your fingertips. Easy-to-access, 6-position, spring-assisted, lever-operated deck lift for simple, smooth and quick adjustments to grass cutting heights from 1-1/2 in. to 4 in.